Synthetic peptide corresponding to Mouse TNF Receptor I aa 29-43. HeLa heat shocked cell lysate. Our Abpromise guarantee covers the use of ab19139 in the following tested applications. WB Use a concentration of 1 µg/ml. Detects a band of approximately 55 kDa. 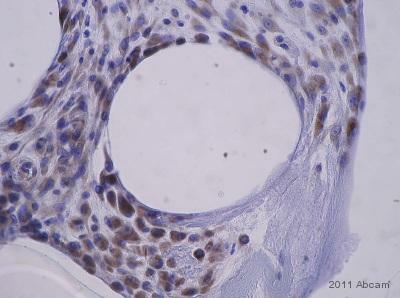 IHC-P 1/1000. Antigen retrieval is not essential but may optimise staining. Incubate for 1 hour at RT. Both the cytoplasmic membrane-proximal region and the C-terminal region containing the death domain are involved in the interaction with TRPC4AP. Cell membrane. Golgi apparatus membrane. Secreted. A secreted form is produced through proteolytic processing and Secreted. Lacks a Golgi-retention motif, is not membrane bound and therefore is secreted. Western blot analysis of mouse RAW 264 cell lysate. 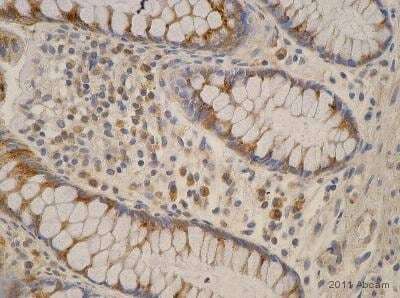 Ab19139 staining human normal placenta. Staining is localized to cell membrane and secreted. Flow Cytometry - Anti-TNF Receptor I antibody (ab19139)Image courtesy of an anonymous Abreview. ab19139 staining TNF Receptor I in Human platelet cells by Flow cytometry. Cells were fixed in paraformaldehyde and permeabilized using 0.1% Triton-X-100 in 2% BSA for 15 minutes. Primary antibody used at a 1/100 dilution and incubated for 16 hours at 4°C. 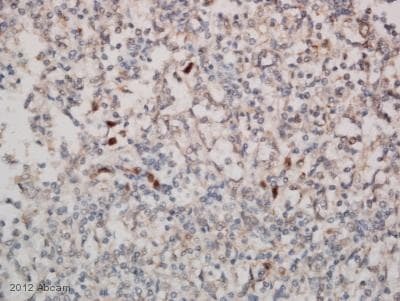 The secondary antibody used was an Alexa Fluor®488 conjugated chicken anti-rabbit IgG (H+L) at a 1/500 dilution. Publishing research using ab19139? Please let us know so that we can cite the reference in this datasheet.